Help EWR be there for the wildlife of Essex County…. On the evening of April 24th, 2015, Erie Wildlife Rescue (EWR) received a call about an injured Peregrine Falcon at the Ambassador Bridge. The bird was brought to an EWR volunteer that evening, and was then taken to the Walker Road Animal Hospital. 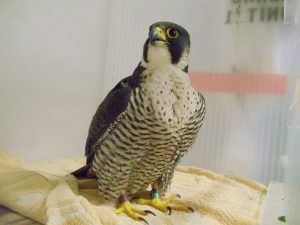 An examination, X-rays and blood-work showed that the falcon was dehydrated and had suffered some trauma, but fortunately had no fractures. Banding information revealed that the bird had been banded in Ohio in 2006, and was Voltaire, the adult female who nested at the bridge. Voltaire received sub-cutaneous fluids and pain medication while at EWR, and was tube-fed a number of times. She quickly showed signs that her strength was returning, and was hand-fed several meals. Voltaire developed signs of becoming stressed in captivity, and was moved into a large flight cage where she had no problem reaching the highest perches, and covering the distance of the enclosure. On April 29th, Voltaire was returned to the Ambassador Bridge for release, and was reunited with her mate. An update from the Windsor Peregrine Falcon Watch Team in September 2015 indicated that she was doing well, and that although she did not have a successful nest this year, hopes are high for next season. To date, Voltaire and her mates have had 15 Peregrine chicks that survived to leave the nest. It is a privilege to care for birds like Voltaire, and so rewarding to know that the care given by EWR made a profound difference to the survival of that one individual. EWR receives no government funding for the care of these animals. Please give generously to EWR, so we can be there for other birds like Voltaire. B.N. 13522-6876-RR0001 Caring for native wildlife since 1978.